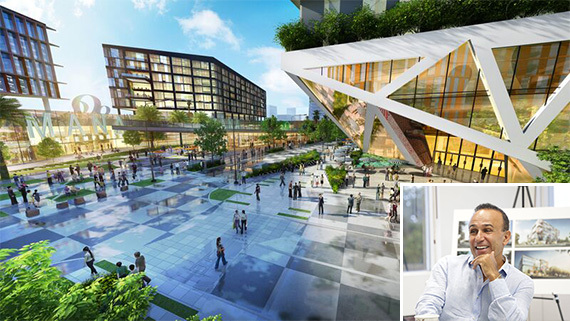 The Miami City Commission took the first step in approving Moishe Mana’s ambitious plan to create an international business, cultural and entertainment-focused campus in Wynwood. Commissioners on Thursday gave preliminary approval for the “Mana Wynwood Special Area Plan,” which would grant the developer several zoning changes that would allow him to build a series of buildings totaling up to 9.72 million square feet on 23.46 acres of land. The assembled land is west of Northwest Sixth Avenue, south of Northwest 25th Street, east of Northwest Second Avenue, and north of Northwest 22nd Street, most of which is just outside of the Wynwood Business Improvement District. Prior to the meeting, the BID issued a statement that Mana Wynwood still needs to address some concerns, including supporting the district’s expansion proposal, limiting its use of temporary permits for special events, and adhering to 100-foot to 120-foot setbacks on Northwest Second Avenue. Mana and the BID have already agreed that Mana Wynwood would respect the scale of the existing neighborhood and the design characteristics of Wynwood by agreeing that all Mana Wynwood SAP projects and signage be submitted for review by the Wynwood Design Review Committee. Commissioner Francis Suarez asked Mana representatives to consider making a contribution to the city’s public transit fund as a condition of final approval. Commission Chairman Keon Hardemon requested that Mana contribute funds for a possible affordable housing program to benefit residents of Overtown, which borders the planned development.